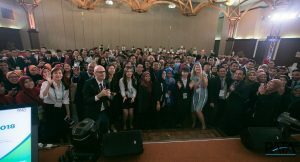 Langkawi (Malaysia) – September 16, 2018 (travelendex.com) – The PATA Youth Symposium, hosted by the Langkawi Development Authority (LADA) and the Alumni Association of UiTM Students’ Representative Council (PIMPIN) in collaboration with the PATA Malaysia Chapter, Tourism Malaysia and Langkawi UNESCO Global Geopark, took place on September 12, 2018 on the first day of PATA Travel Mart 2018 with the theme ‘Inspiring Tourism Leaders of Tomorrow’. Organised by the Pacific Asia Travel Association (PATA) Human Capital Development Committee, the highly successful event welcomed 210 local and international students from 17 universities with participants coming from Bangladesh, Canada, Nepal, Philippines and Singapore. The programme was developed with guidance from Dr. Markus Schuckert, Chairman of the PATA Human Capital Development Committee and Assistant Professor at the School of Hotel & Tourism Management, The Hong Kong Polytechnic University. The third keynoted address was delivered by Dr Neethiahnanthan Ari Ragavan, Executive Dean, Faculty of Hospitality, Food and Leisure Management, Taylor’s University and President, ASEAN Tourism Research Association (ATRA). “We are in the fourth industrial revolution focusing on automation, AI, and machine learning. Many jobs will be replaced by machines. As the next generation of tourism professionals, you need to be prepared to learn skills that cannot replaced by robots, being employable rather than just being employed,” added Dr. Ragavan. During the ‘Inspiring Leadership: Groom and Grow into an Industry Leadership Role?’ panel discussion, the participants heard from Rika Jean-François, Commissioner, ITB Corporate Social Responsibility, Competence Centre, Travel & Logistics, ITB Berlin, and Dmitri Cooray, Manager Operations, Jetwing Hotels, Sri Lanka. The speakers noted that the travel and tourism industry is in the business of people, networking and peer to peer work. They also noted that a good leader needed to have confidence, learn from their mistakes, gather tasks and responsibilities with both hands, and be able to adjust to the rapid growth of the industry. Most importantly, they told the student delegates that in order to change the perception of the industry towards young graduates, they need to be persistent but respectful. The symposium also featured an interactive roundtable discussion on ‘What inspires you to contribute toward a successful tourism industry?’. In addition, PATA Young Tourism Professional Ambassador, Ms. JC Wong, provided participants information on ‘The PATA D.N.A. – Empowering you for your future’. Ms Wong emphasized that 64.5million new jobs could be created by year 2028 in the Asia Pacific region. The leaders of tomorrow should get themselves exposed, connected and involved with industry leaders in their early age to empower them for their future career development. More importantly, striking their dream career. She shared a list of PATA Youth Activation initiatives for student delegates to kickstart their journey, including internships, sponsorships and workshops. In recent years the PATA Human Capital Development Committee has organised successful educational events at various institutions including UCSI University Sarawak Campus (April 2010), Institute for Tourism Studies (IFT) (September 2010), Beijing International Studies University (April 2011), Taylor’s University, Kuala Lumpur (April 2012), Lyceum of the Philippines University, Manila (September 2012), Thammasat University, Bangkok (April 2013), Chengdu Polytechnic, Huayuan Campus, China (September 2013), Sun Yat-sen University, Zhuhai Campus, China (May 2014), Royal University of Phnom Penh (September 2014), Sichuan Tourism School, Chengdu (April 2015), Christ University, Bangalore (September 2015), University of Guam, USA (May 2016), President University, BSD-Serpong (September 2016), Sri Lanka Institute of Tourism & Hotel Management (May 2017), Institute for Tourism Studies (IFT) (September 2017), and Gangneung-Wonju National University, Korea (ROK) (May 2018). For further information, please email HCD@PATA.org.